It’s clear by now that the number one roadblock to crypto adoption is education. Just like it was in the early days of the internet, it’s not so simple for the average person to tap into the advantages of crypto assets, nor are the advantages even clear to everyone at this point. I remember well the great debate about the usefulness of the internet that raged throughout the 90s. It wasn’t really until the invention of the smartphone, the pocket version of the internet, that everyone truly realized the power of the tool we’ve created. For my new year’s resolution in 2019, I’ve decided to commit to creating more educational content for crypto beginners and to raise the level of awareness about the emerging asset class. 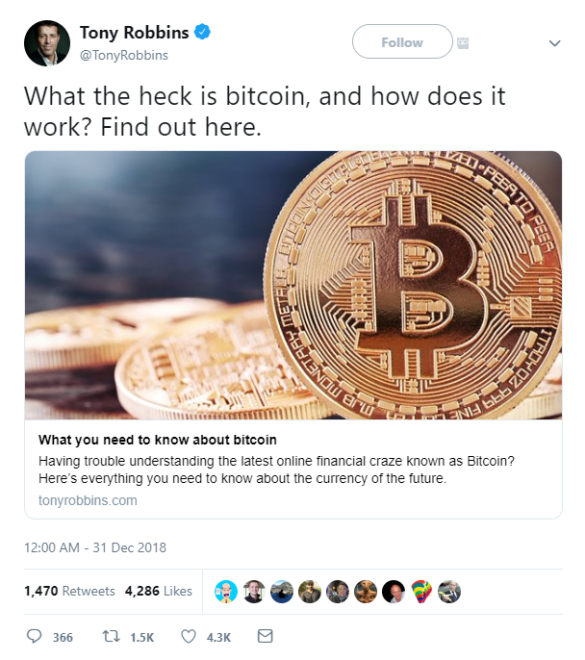 In the past few days, we’ve seen exceptional examples of this from Time Magazine, which put out an excellent article stressing the benefits of decentralized money and from Tony Robbins, AKA America’s Life Coach, who put this out for his three million followers. Please note: All data, figures & graphs are valid as of January 2nd. All trading carries risk. Only risk capital you can afford to lose. The stock markets are not off to a great start this year. Some sour manufacturing data in China was released this morning and stocks in Asia and Europe are taking a hit. Still, the new year hangover hasn’t yet completely worn off. It won’t be until Monday that markets really return to full strength. The New York session may prove exciting, though. As we saw last week, low volume trading can often turn volatile, especially as we head into the 12th day of a partial government shutdown. 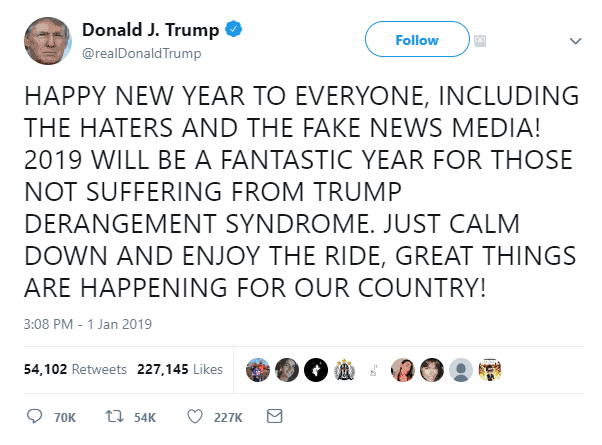 President Trump’s all caps new years tweet also carried what some have interpreted as a hidden message for the financial markets. The US President’s reassurances have done very little for investors this morning though, who do seem to be erring on the side of caution. Gold continues to climb, both on the current uncertainty of global politics and the weaker US Dollar. We’re now testing the psychological level of $1,300 per ounce. This level probably won’t be very easy to breach, especially coming off the strong run we’ve seen over the last month. Crude oil is also testing a boundary at the moment but on the downside. It’s becoming clear to all now that OPEC simply does not enjoy the same level of influence over the price that they used to. This new free market has a lot more competition, which is spurring on more production and more supply. The level of $45 a barrel is being watched very closely. Now that it seems the US is unlikely to approve any bitcoin backed ETF any time soon, the number one event on the watchlist of many cryptotraders is the launch of Bakkt. For those of you who are not familiar, Bakkt is a new crypto service that was started by the owners of the New York Stock Exchange, which plans to offer a crypto holding service and debit card that it will make it very easy for everyday customers to store and spend bitcoin. Over the weekend, Bakkt announced an extremely successful funding round of $182.5 million that has come from various Wall Street institutions and should ensure a smooth launch of the new service. However, the launch of their platform was supposed to be on December 12th but was later delayed to January 24th. Possibly due to the US government shutdown, it seems that the launch has again been delayed, this time without a confirmed launch date. We know that it’s going to happen and that it’s very likely to be a great step forward for crypto adoption but it seems we’ll need to continue being patient while they get set up. Before I let you go for today, I did want to ask you to take part in a short survey. It’s only one question and shouldn’t take you more than a minute to vote, comment and share. I’ll be sure to post our findings in the daily market update early next week and hopefully get a better understanding of the crypto industry. 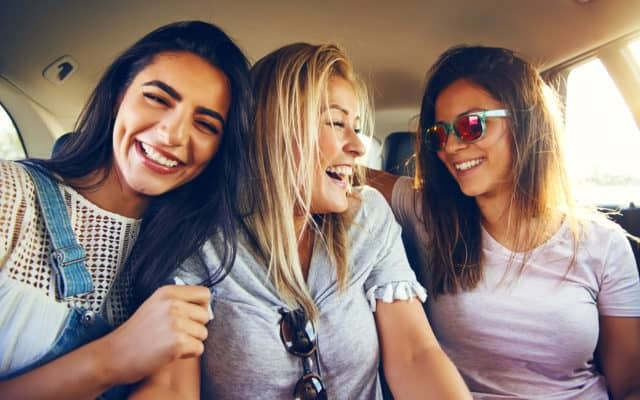 The post Calm Down and Enjoy the Ride appeared first on Bitcoinist.com.